Rare £5 notes can sell for thousands of pounds. Here, we look at which Winston Churchill polymer fivers are proving popular, and explain everything you need to know about spotting a valuable one. Rare £5 notes are still proving hugely popular with collectors, with certain 'plastic' fivers selling for huge sums online. But how can you tell if you own a valuable new polymer £5 Winston Churchill banknote? Read on to find out which £5 notes tend to sell for high amounts, and learn how to spot them. A Winston Churchill banknote with the serial number 'AK37 007' sold on eBay for £5,000 earlier this year. The 'James Bond' fiver was described in the listing (pictured below) as being in "excellent condition" with the "faintest creases". A note with the same serial number also sold for £5,000 last October. You could make an even bigger profit if you manage to get your hands on a 'Jane Austen' fiver. Graham Short, a micro engraver from Birmingham, was commissioned to etch a tiny 5mm image of the author onto the new polymer notes. It appears just next to the images of Sir Winston Churchill and Big Ben. Classic quotes from Emma, Pride and Prejudice and Mansfield Park have also been engraved on the notes. Sadly there are only four in circulation, but it's believed they could be worth as much as £50,000 each. They went into circulation on 4 December and the serial numbers range from AM32 88551 to AM32 88554. Sadly, three of the notes have already been accounted for, meaning just one remains up for grabs. Even if you aren't fortunate enough to find one of the 'Jane Austen' or 'James Bond' notes, there are a number of other polymer fivers that are worth a fair whack — and are far more common. As we mentioned earlier, notes that feature any serial number starting AA01 are selling for hundreds of pounds. The first-ever note has the serial number AA01 000001 and was given to the Queen, but there are 999,998 other new fivers with the AA01 prefix. 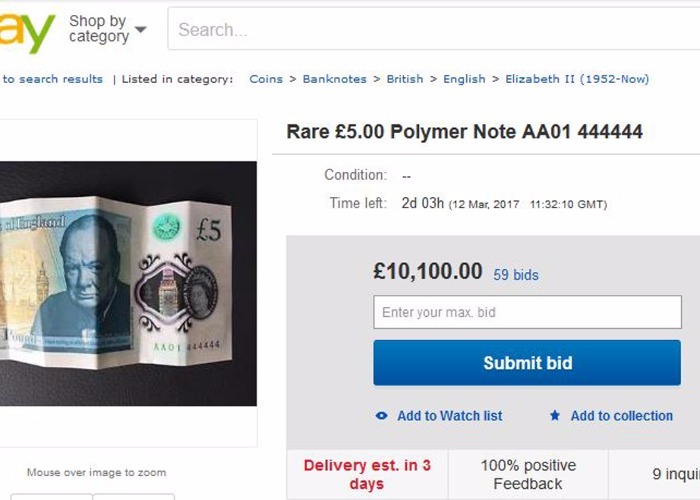 Tim Mitchell, a business owner from Llandudno, managed to get 30 of these £5 polymer notes when he went to get change at the bank and expects to make at least £1,200 by selling them to collectors on eBay. On 3 October, the Bank of England auctioned a batch of the low serial number new £5 notes for charity. One of the notes with the serial number AA01 000017 sold for £4,150. The Bank of England has donated some notes with significant, or low level, serial numbers to people and institutions that were involved in its development or that traditionally get one when a new series is launched. For example, the Churchill War Rooms has been gifted the note AA01 001945. Your strategy is pretty straightforward, really: pay a visit to your bank and take out some cash, visit an ATM to withdraw money or spend larger notes to get change and boost your chances of getting one. Around 5,200 ATMs dispense £5 notes according to the Bank of England and most have been adapted to handle the new polymer version. You could decide to pick one up on eBay and hope that it rises further in value later on, although that is a risky strategy — and not just because it could be a counterfeit note. To state the obvious, these notes are only worth what someone is willing to pay for it, and when there's a rush of interest (as there is now), prices tend to be inflated. There's no guarantee you'll even get your money back, let alone make a profit, so proceed with caution. There's also a chance that the old paper £5 note will be worth more once it is phased out and withdrawn from circulation, so you may want to hold onto the ones you have now. The old paper £5 notes featuring Elizabeth Fry will eventually be withdrawn from circulation on 5 May 2017. But there are other new notes due to be released that could also be valuable if you get one of the first batch. From summer 2017, there will be a new £10 featuring novelist Jane Austen and from 2020 there will be a new £20 note carrying the image of artist JMW Turner. Like the new Churchill fiver, the new notes will also be printed on polymer. There are currently no plans to replace the £50 note that feature steam engine pioneers Matthew Boulton and James Watt.